Yesterday’s massive Things 3.4 update has caused quite a stir in the iOS automation community. 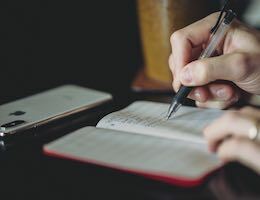 The newfound ability to create entire projects through JSON, or to automate using Workflow and other URL-scheme apps, brings Things closer to the levels of automation that could be had in GTD apps like OmniFocus. Not everything in Things is on equal footing with its GTD competitors though. Thanks to Matt Cassinelli’s jaw-dropping guide that we published yesterday, I’ve been able to overcome one of Things’ current pitfalls. 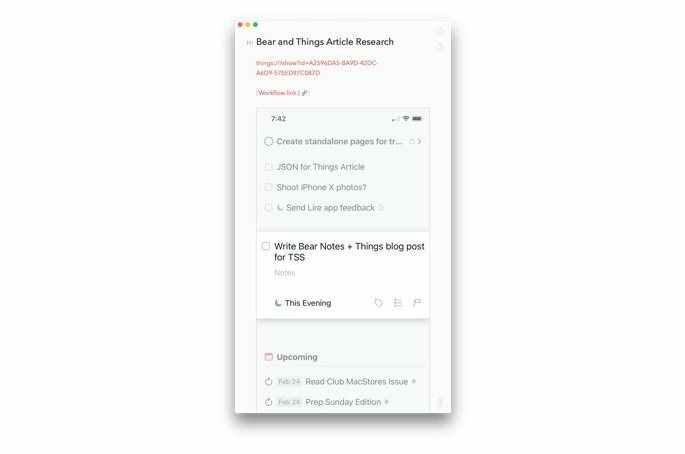 Bear is our pick for the best note-taking app for iPhone and iPad. It has a great combination of features (like URL scheme support and a tremendous share sheet extension), a great design, and is extremely easy to use on any device. Hit the ellipses button when a task is selected in Things and select the Share button. Copy the link to the Things task. 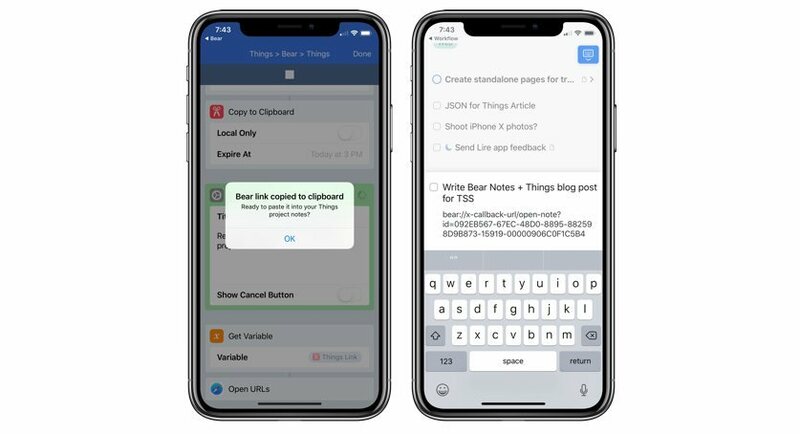 Jump into Bear and create a new note with a title for the task. Paste the Things URL into the Bear note. Swipe back in Bear to get to the main list of all my notes and swipe on the specific note to copy the note’s link. Return to Things and paste the Bear URL into the task notes. Boom. Done. End of story. With this little workflow, I can tap on a task, tap on the Bear URL in the task notes, and jump to a note where attachments like PDFs, images, videos, URLs, and formatted text are all supported. Of course, this entire workflow is far better completed using an actual Workflow workflow. Using Workflow, the entire process above can be done in about five seconds. 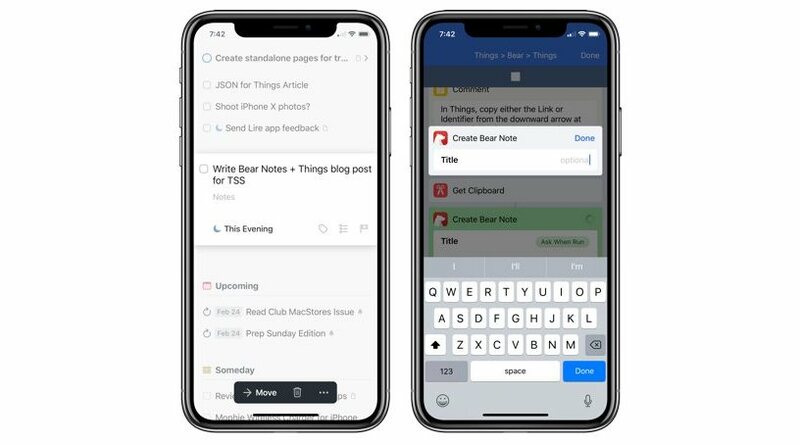 I use this workflow to take the Things task URL and paste it inside a new note in Bear before jumping back into Things with the Bear note URL properly copied to my clipboard. A quick paste into the Things task notes and I’m all finished. Copy the link to the task. Open Workflow and launch the Things → Bear → Things workflow. Type out the new note’s title inside Workflow and hit Done. Let Workflow do its magic by pasting the copied Things task URL into a new Bear note before returning to Workflow. Paste the URL into the Things task notes after Workflow whisks me there with a prompt. Voila. Tic tac toe and I’ve got a complete repository of all the notes, URLs, images, photographs, checklists, and whatever else I might need to complete a specific task in Things. Thanks to Bear’s linking support within Bear, I can take this a step further and create a lead-sheet note inside Bear that has URLs to a bunch of other notes inside Bear, if the project I’m working on requires more than one note repository. For instance, I have this project I’m working through on my own blog where I used Bear to extract all the images, URLs, and text from some old blog posts I wrote way back when. Each of those web page extractions created a new note inside Bear. By running the above workflow, I can create a new note inside Bear that links to the Things task, and then I can paste all the other note URLs inside that lead-sheet Bear note. This creates a properly linked project, with note repositories and tasks in different spots on my iPhone. In the long run, I hope I don’t need to use this type of workflow to maintain rich task notes for Things. As other apps like OmniFocus and Todoist already support note attachments, I hope Cultured Code has intentions to add support to Things. If not though, this little workflow does the trick. 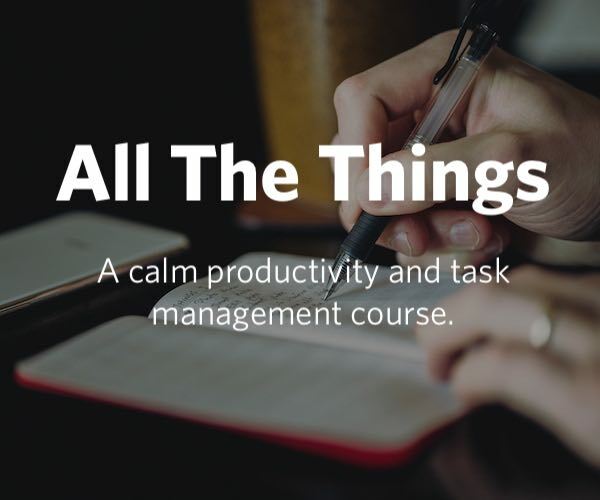 It creates a quick connection between my Things task and Bear research and helps keep all my thought processes in one collective spot rather than scattered willy nilly here and there.